Organic Damascus rose oil (also known as the Damask rose) not only can benefit mood and serve as an antiseptic, but also smells great. Roses are an age-old expression of friendship, love and beauty. Rose essential oil is coming into its own. Once used to dab on light bulbs and release its heady scent or as an additive to potpourri, organic Damascus rose oil is now used for many different purposes. These are just a few of the many things that rose essential oil claims as benefits. Botanists call it Rosa Damascena, but the flower is more commonly known as the Damascus rose. The essential oil is typically extracted through steam distillation; this is known as rose ottos. However, the oil can also be extracted by solvents such as hexane, with the final product being known as rose absolutes. Damascus roses are highly fragrant and have a high oil content, making extraction of the essential oil a bit easier. In addition to being used for essential oils, these roses are often used in the manufacturing of perfumes. 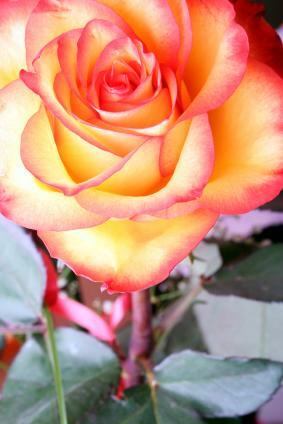 Rose absolutes are typically used in perfume. Essential rose oil is quite expensive and compares to the cost of buying other organic oils. Damascus roses are a hybrid of Rosa moschata and Rosa gallica. Historians believe the roses were brought to Europe from Persia by Robert de Brie between 1254 and 1276. Damascus is a major city in the Middle East and is even referred to in the Bible. Although this article focuses on the damask rose, there are two basic roses that are used in the production of essential rose oil. Rosa damascene - Also known as the damask rose or Damascus rose, this variety grows in Iran (Persia), China, India, Turkey, Bulgaria and Russia. Rosa centifolia - Sometimes called the "cabbage rose" by gardeners, this variety can be found in Egypt, France and Morocco. The roses are hand-picked in the morning when oil content is the highest and processed the same day. It takes about 40,000 blossoms to make one ounce of pure rose oil. For those who are wondering how to use organic Damascus rose oil, it is quite simple to use. As a perfume, simply dab it on your skin. The oil is quite mild and can even be used for massages. Avoid eyes and mucus membranes for safety. Add a drop to face cream to soothe inflammation. The oil is also though to help with depression, nervous tension and stress. Simply dab some oil on temples, chest or breathe in the heady fragrance for benefit. The oil of the Damascus rose is also said to have aphrodisiac qualities. Use essential oil diffusers, or get brave and spread the oil on covers and around your bedroom to increase romances. The frequency of the rose's oil is said to nearly match that of the human brain, which might be why the rose's scent has such a calming effect on humans. Another idea is to add a couple of drops of the oil to your bathwater. Remember that this oil is very concentrated, so just a little will go a long way. A small bottle should last quite a while, because you do not have to use much at one time to gain benefits from the rose oil. Consider using rose oil with other oils. Your local health food store and many different online essential oil sites can help you determine which products work best for your individual needs.